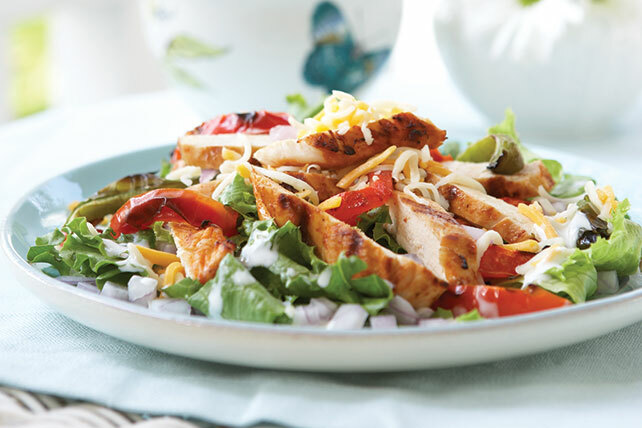 Chili powder and lime juice put the fajita in this quick and easy chicken salad for four. Don't count on any leftovers! Mix lime juice and chili powder; pour over chicken in shallow glass dish. Turn chicken to evenly coat both sides of each breast. Refrigerate 20 min. to marinate. Heat grill to medium heat. Remove chicken from marinade; discard marinade. Grill chicken and peppers 5 min. on each side or until chicken is done (165ºF). Cut chicken and peppers into strips; place in large bowl. Add lettuce and onions; mix lightly. Top with cheese and dressing. No time to marinate and grill? Substitute 2 pkg. (6 oz. each) OSCAR MAYER Southwestern Grilled Chicken Breast Strips for the grilled marinated fresh chicken. Cut peppers into thin slices and add to salad without grilling. Cook chicken and peppers under the broiler instead of on the grill. Make some fun and delicious wraps by serving this salad wrapped in large flour tortillas.